Eryx johnii is a nonvenomous boa species. Adapted to burrowing, the head is wedge-shaped with narrow nostrils and very small eyes. The body is cylindrical in shape with small polished dorsal scales. The tail, which is blunt, rounded, and not distinct from the body, appears truncated. Juvenile Eryx johnii are boldly patterned with alternating dark and lightcolored bands that typically grow brighter and more contrasting on the tail but as they reach maturity and the bright colors fade uniformly to a dark coloration. Any glass or plastic, tightly covered enclosure with adequate air holes works. Babies thrive in plastic shoeboxes. A mature adult will need at least a 10-gallon aquarium (approx. 0.5 x 0.3 meters (1.6 x 1 feet)) or enough room to stretch out. Although sand boas burrow and spend a great deal of time under the substrate, they will readily use hides placed on top of the substrate. These habitat additions provide you with more viewing opportunities and a place for your snake to feel safe. An upside down terra cotta plant saucer works nicely: break a small piece off once side to make a peek hole. A hollow, Chollo cactus skeleton placed directly on the substrate is another favorite hiding place of sand boas. Eryx johnii seem to prefer a heavier substrate such as a small chunk bark. The bark also provides slightly higher humidity levels which this species prefers. NEVER use any kind of pine or redwood wood shavings: the fine particles will cause respiratory problems. The target temperature is regulated by attaching an ordinary rheostat to the heat tape cord. Monitor the temperature with a thermometer buried in the sand directly on the bottom of the warm side of the cage. Eryx johnii prefer to live in sand at a temperature of 32-35 °C (90-95 °F) during the day. The best way to achieve this is to place a heat tape under ONE side of the cage. Always be certain there is a cooler side for the snake to move to if the temperature gets too warm. The cool side temperature should range between 24-29 °C (75-85 °F). You can monitor your temps either by placing the thermometer in the sand or by using temperature gun if you have one. Clean, DISTILLED water should be available at all times. Place a shallow bowl at the cool end of the habitat. Eryx johnii are from the lowlands of India, for the most part, so humidity around 40-50%. A robust keeper, sand boas are known for their hearty appetites. The babies are so big at birth (30-40 grams) that rat pinks or mouse fuzzies are appropriate to start. If you have one snake in the enclosure, put a live pinkie directly on the substrate. Because it may be damp, a thawed pinkie should be offered on a paper or plate to prevent sand from sticking to the meal. Expect your snake to eat within one to two hours, occasionally it make take longer. A more controlled method is to place your snake in a clean plastic container (cut air holes) with the pinkie. This prevents accidental ingestion of substrate, or competition for the same pinkie if you have more than one snake in the cage. A young snake can become nervous in this new enclosure and refuse to eat. Every snake is a little different, but once you figure out what works for it, feeding is not a problem for sandboas. Young snakes require weekly feedings for the first year. 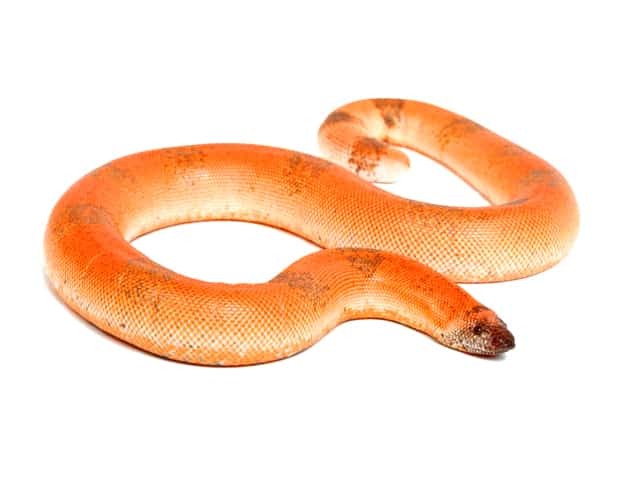 Sand boas rarely try to bite. Sometimes they will flail about if scared, but they rarely make contact with your skin. If the snake does manage to bite, try not to jerk back. This can injure the snake. If necessary, a small dab of alcohol near the mouth should cause it to release. Sand boas are poor climbers, so when handling, ensure that the entire length of the snake is well supported. When placed on a surface, they will quickly look for anything to hide under, so keep that in mind and never let them out of your sight. A clean cage insures a healthy environment for your snake. Spot clean as necessary and plan to change the substrate once a month or two and thoroughly wash and sterilize the enclosure at the same time. As with all snakes, shedding interrupts the feeding cycle. Most snakes will not eat immediately before or during the shedding process. Also, many snakes are nervous or cranky about intrusions into their environment prior to shedding. Expect your young snake to shed following 2 to 3 meals. Difficulties with shedding can be avoided by offering your snake a moist sauna in which to soften its skin. Cut one or two access holes on the bottom of the side of a plastic container (with lid) and line it with a moist paper towel for humidity. Place the sauna over the warm side of the cage where it can remain continually or be introduced prior to shedding. Another method of assistance is a short, warm, water bath. Health problems are about the same as the rest of the sandboa group; bacterial infections (mostly RI), viruses like stargazing (Inclusion body syndrome), and retentions from giving birth are the ones that come to mind.